More discussion of this to follow, of course. Short piece in The Star this morning with photo. (Authors in the pic : (far left) Lim May Zhee, (fourth from left) Lydia Teh, (far right in smart suit) Kam, (next to him) Amir. Adibah wasn't able to attend as she was not well enough. I had not realised that there were also Bahasa Malaysia awards and that Popular teamed up with Malay language newspaper, Berita Harian to award these! have photos!!! will post on FB! ms d - may i steal? hello, i was wondering if you knew what happened to reader's corner at subang parade? has it been relocated or closed for good? sorry, i know my question is irrelevant but there's no one i could ask. 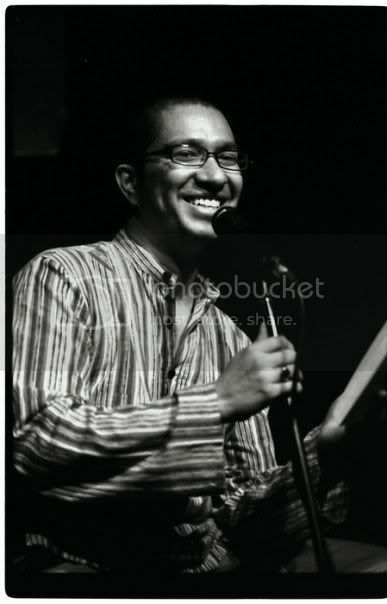 Highlight for me was when the MC was reading out the English-language nominees, and when he got to 'Tanah Tujuh', he seemed confused and said, "And now we have moved to the Malay section..."
The highlight to Raman must be the mention of the Pulitzer and the Booker in the YB's speech. fyi to those interested in travel writing/stories: Zhang Su Li, author of A Backpack and A Bit of Luck is giving a talk on Wednesday (today?) at the Popular Bookfest at 7:30 p.m.
Also heard of an autograph signing by Mahathir M. on thursday but will likely to give that a miss! sure, sharon! give me a day, am at shelters now :) by tonight (poke me to remind me). amir and kam - congratulations! tak buat kenduri ke? hehehe! yeah ... we partying post-Poppies??? lil ms d, I'm looking for photos of the event! Can I have them too? I am looking for one of the entire event, of the media and also the people on stage. I was probably the most shocked author in the room when my name was announced! There were so many better authors in the list and I was already preparing myself for the disappointment. I even made a bet with my friend that I wouldn't win! But you know what's better than cinching third spot? Seeing my favorite authors win second and first. =) I couldn't feel happier standing next to Kam and Lydia. Bahasa Melayu books, be it fiction or non-fiction, have a big market in Malaysia, no doubt. Congrat to the winners! The last two literary awards I won were 25 and 30 years ago respectively, and I cheated in both of them. So it's nice to have won something without having to resort to underhand methods, because multiple voting was allowed on this one. It was fun. I'm also looking for pix. The photo of the Berita Harian winners are so cool. Now why didn't I think of taking one like that? I have a contest at my blog to thank my readers for making the win possible. If any of you are interested, pop over to leave a comment. That's all it takes. thanks, mizranee. i think though it's the same story everywhere - there are just too many distractions and reading takes some effort. still, we fight on by buying books for friends, by letting our own enthusiasm catch light. awards are necessary but it's a bit chicken and egg - we almost need a big enough pool of good writers. i think we are beginning to move towards that situation.